Abdou Sarr had a difficult decision to make. The talented tech-minded teenager from Ottawa was considering computer science and business programs at several Ontario universities. 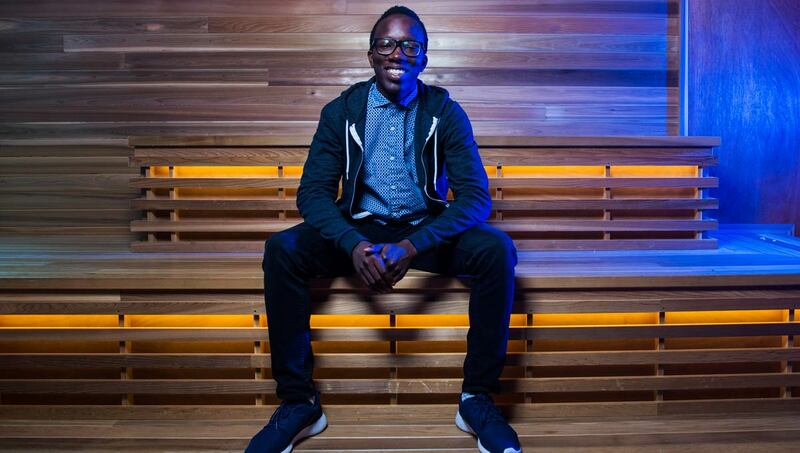 Sarr, who started coding while in Grade 4 and developed a relaxation app in high school that soared to the top of North American sales charts after earning an endorsement from rapper and tech investor Snoop Dogg, wasn’t sure which route to follow. Then a new option arose, and he jumped at the opportunity. “This is perfect,” says Sarr, one of 11 students enrolled in the first cohort of a multi-year internship created by Carleton and Shopify, the booming Ottawa-based commerce company. 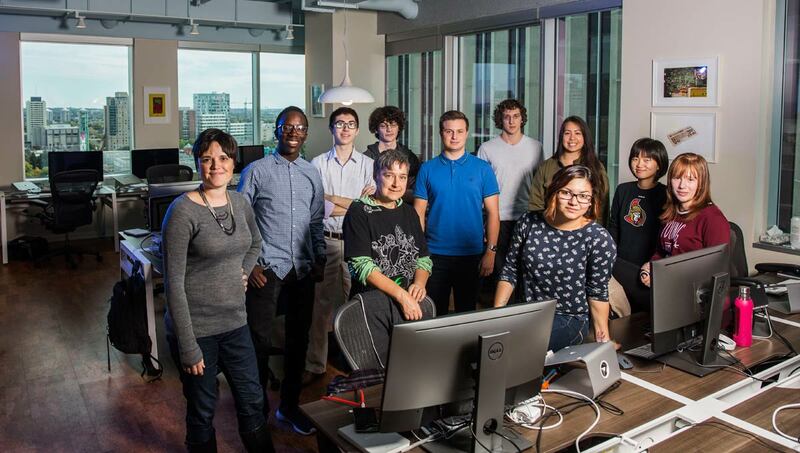 Gail Carmichael (left), Shopify’s manager of external education programs, and the students. These Shopify internships will see students split their time between the Carleton campus and Shopify’s downtown headquarters throughout their four-year Bachelor of Computer Science program. They’ll learn both in the classroom and by doing hands-on work, with Shopify paying a salary and covering their tuition as well. Natalia Kingsbury, one of Sarr’s classmates in the program, wasn’t sure she wanted to go back to university. Originally from Colombia, Kingsbury spent the final year of her undergraduate Industrial Design program on exchange at Carleton in 2014, then worked in Ottawa for a couple years until reaching a career crossroads. 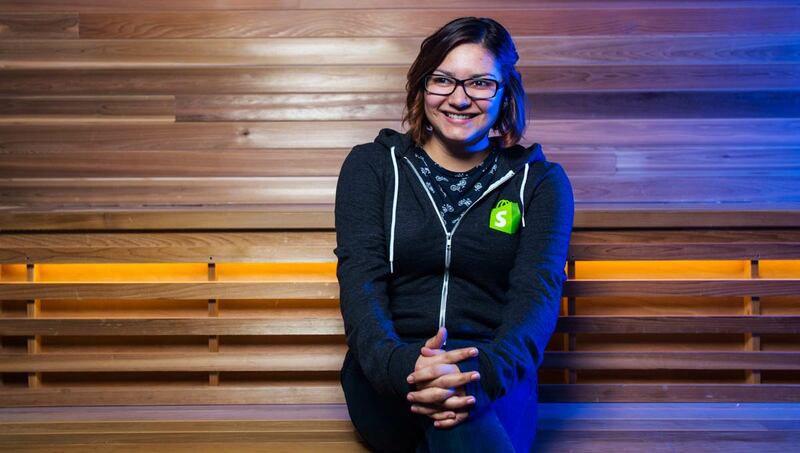 She first heard about these Shopify internships at a software development workshop for women. “The fact that it was a combination of Carleton and Shopify was huge,” says Kingsbury. “Industrial design is about problem solving, but computer science gives you tools and the mindset you need to solve problems. What’s more, she says, as a mature student who’ll be 30 years old at graduation, the internship will give her practical experience to list on her resume, not only another degree. The concept of a partnership like this was conceived by Jean-Michel Lemieux, Shopify’s senior vice-president of engineering, when he was working for software company Atlassian in Australia. Lemieux, who spent four months chairing an industry review of software engineering degrees at the University of Sydney, brought the idea to Canada when he moved back home and began working Shopify in 2015. 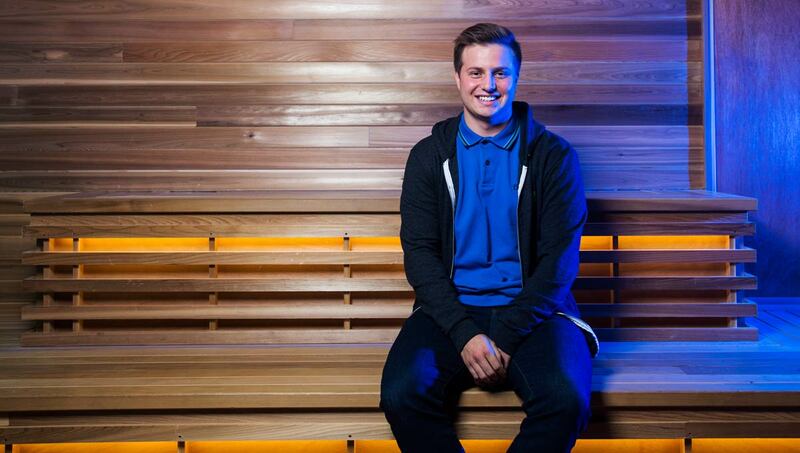 “Over the years, Shopify has hired high school and university interns as a long-term investment in talent, and we quickly realized that some of the best ideas and contributions were coming from our interns,” says Lemieux. “If you consider that high school and university students today are the first generation of “Internet kids,” meaning that they grew up in a world of ubiquitous Internet access with any information at their fingertips, it’s not that surprising. Shopify is the world’s leading cloud-based, multi-channel commerce platform designed for small- and medium-sized businesses. Merchants can use the software to design, set up and manage their stores across multiple sales channels, including web, mobile, social media, brick-and-mortar locations and pop-up shops. Shopify currently powers more than 300,000 businesses in approximately 150 countries, and is trusted by brands such as Tesla Motors, Budweiser, Red Bull, the LA Lakers and many more. 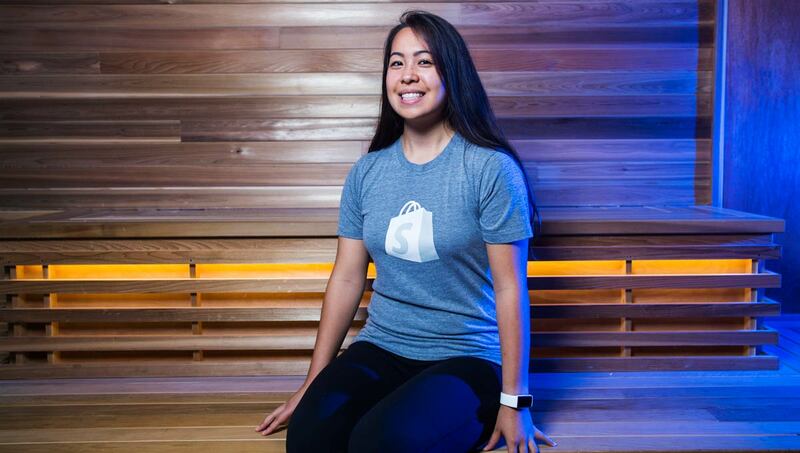 “We talked with many interns about staying on at Shopify,” says Lemieux, “and although they all agreed that they were learning so much by working with the some of the best developers on the planet, the majority wanted a degree for their future flexibility. Some of them saw their parents lose their jobs in the crash of 2009 and 2010, and for them a university degree is an insurance policy. “We started talking to universities and researching to see if someone had tackled integrating practice and theory in creative ways. It turns out that no one had. 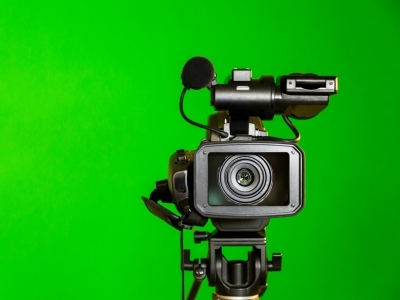 But universities have recognized the need for a new model for experiential learning. In fact, the majority of Canadian universities have it as a key pillar in their strategies. But they haven’t been able to do much without a strong partnership with industry. 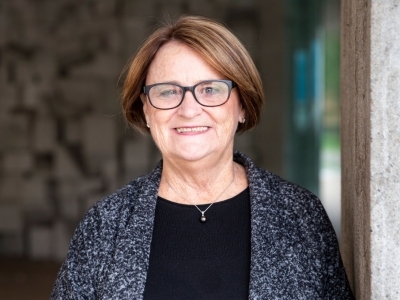 In January 2016, Carleton Faculty of Science Dean Malcolm Butler and Doug Howe, director of the School of Computer Science, met with Lemieux and Shopify’s manager of external education programs, Gail Carmichael, who has a bachelor’s degree and a master’s in Computer Science from Carleton and is three-quarters of the way through her PhD. Everybody agreed that an internship could work, and staff at the university and company have spent the last few months ironing out the logistics and details. 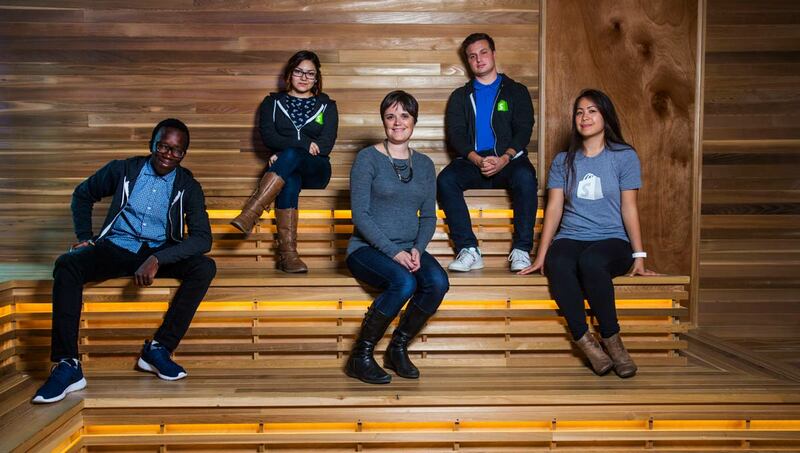 At Shopify, mentors will take on the role that professors and instructors have at the university. Members of Carmichael’s five-person external education team understand what “competencies” are required as part of Carleton’s computer science degree. Students will spend about half their time at Shopify learning material for some core computer science courses and earning credit for practicums. Advanced courses and electives will be taken traditionally on campus. 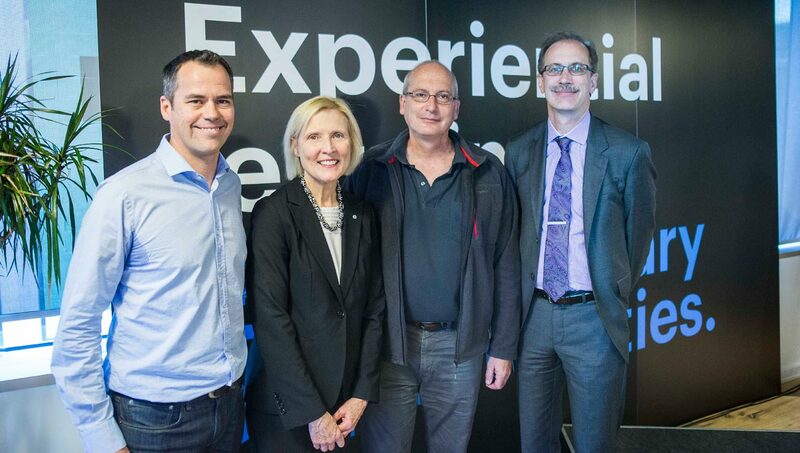 From left to right: Jean-Michel Lemieux, SVP of Engineering at Shopify, Carleton University President Roseann O’Reilly Runte, Doug Howe, director of the School of Computer Science, and Faculty of Science Dean Malcolm Butler. Carleton will be in charge of the program’s curriculum and student evaluation — two of the measures that helped assure the university’s Senate that the internship is a good fit. The School of Computer Science has appointed a faculty liaison who will meet bi-weekly with students, and customized learning outcomes will be established for each student in each internship course as a result of discussions between the student, the liaison member and Shopify’s program co-ordinator. Students also have access to all the academic and student services at Carleton. 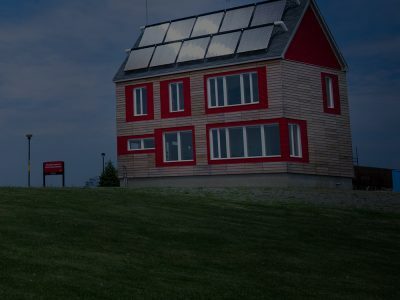 Butler likens the experience a computer science student will have at Shopify to a physics student doing their degree while working at CERN, the European Organization for Nuclear Research. Not only will students develop an integrated set of skills, they will also bring what they’re learning back to the university. The experience will give students a head-start on their careers, or it could spark entrepreneurial ideas — or propel students on to graduate school. The new Shopify internships address the goals of Carleton’s Strategic Integrated Plan in a number of ways. It will help ensure the employability and future success of students through experiential learning and innovative teaching. It will help meet a societal need — in this case, a shortage of more than 200,000 information and communication technology workers that the Information and Communications Technology Council forecasts Canada will face by 2020. Moreover, the Shopify internships will raise Carleton’s profile as a go-to institution for computer science students. 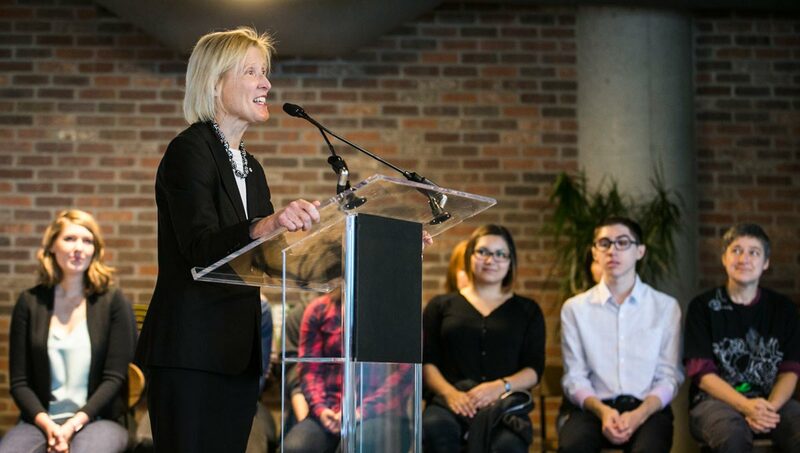 President Roseann O’Reilly Runte shares details of the new partnership<br /> with Shopify inside the company’s downtown Ottawa office. “One of the motivations is to attract more top-quality students from across Canada and the United States to Carleton,” says Howe. “This is an elite program. Students will get the fundamentals and principles from Carleton and apply these ideas at Shopify. In the context of a course, you learn by doing things. And because they’ll be at Shopify year-round, they can get deeply involved in long-term projects. Helping to develop and keep talent in Canada is one of the attractions for Shopify, even if students don’t stay with the company after graduation. It’s part of Shopify’s focus on good citizenship, says Carmichael. “Shopify and Carleton University are showing real leadership with this program,” said the Honourable Navdeep Bains, minister of Innovation, Science and Economic Development, who attended an event celebrating the collaboration at Shopify’s downtown Ottawa offices on Oct. 12. Shopify and Carleton are also working toward more gender equity in a traditionally male-dominated discipline. Six of the 11 students are women, a big step in a field that’s usually 10 to 15 per cent female. The interns were not only recruited at high schools, but also through the local Girl Develop It community, which is run by a non-profit organization that provides affordable programs for adult women interested in learning web and software development. Seven of the interns are coming right from high school; the others are mature students. The program, she adds, “provides an opportunity to do meaningful work much sooner in your degree — you’re contributing as part of a team. “It’s also an opportunity for more personalized education. You can really do the things you’re passionate about. This is great for a certain type of learner: understanding the ‘why’ before the ‘what’ can be very powerful. “We’ll be able to give credit for skills that are impossible to get in the classroom, where you can only simulate what people do in the real world, not contribute to a platform that thousands of people are using. If this year’s pilot is successful, the program could be expanded to up to 25 or so students next fall — and, further down the road, rolled out so Carleton can partner with other companies, and Shopify with other universities. Shopify is a Canadian e-commerce company headquartered in Ottawa, Ontario, that develops computer software for online stores and retail point-of-sale systems. The School of Computer Science offers a variety of Undergraduate and Graduate degrees including specializations in areas such as Computer Game Development, Computer and Internet Security, and Data Science. 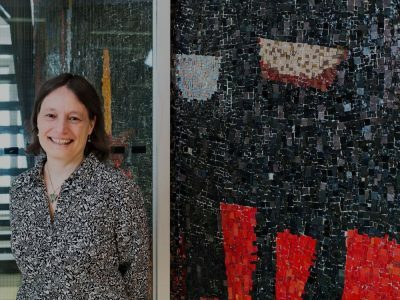 Carleton's Faculty of Science is a research-intensive, integral part of a university which prides itself on being a discovery and innovation leader.